Surplus can be defined in a few ways. If a company sets a number of items to keep in stock, when the inventory surpasses this set number, that is a surplus. If a company accidentally orders too much inventory or doesn’t sell as much as they expected, the extra inventory is also considered surplus. One popular source of surplus comes from a manufacturing facility looking to liquidate old items that are just sitting on the plant floor. Another common cause is a plant closing. Surplus affects all companies with stock. Many companies purchase this surplus and then sell it to customers who need it. Surplus inventory for sale is more common than some might realize. Let’s use a well-known department store as an example of this process. TJ Maxx purchases surplus from a variety of companies, from beauty to fashion to home goods. It then resells this surplus in its stores. Industrial companies treat their surplus the same. Radwell International, for example, purchases surplus from companies in a range of manufacturing industries, and sells the products to customers who need them. Where Does Radwell Get Its Surplus? Most of the surplus inventory comes from industrial automation, MRO, pneumatic, motion, electronics, hydraulic, HVAC and electrical control equipment companies. Radwell focuses on surplus plant floor and facilities maintenance machinery. This machinery ranges from industrial automation equipment, PLCs, drives, motors, electronic parts and more. Radwell has over two billion dollars in certified preowned products. 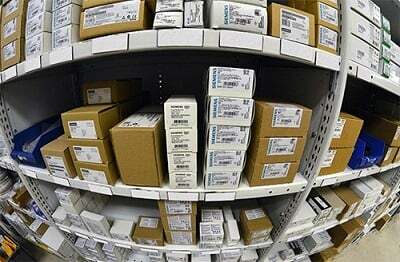 Surplus parts are low-cost, high-quality solutions to broken components and systems. Radwell offers its customers quite a few benefits in terms of surplus inventory liquidation and surplus inventory available for sale. Radwell’s facilities contain extensive testing and certification processes that occur before a surplus item is put back on the market to sell. If the quality of a company’s surplus doesn’t fit the standards, or if there is no demand for that kind of product at that time, it will be recycled. Radwell offers a two-year warranty for the industrial automation product sold and customers can purchase a one-year extension if they’d like. If a machine breaks down, Radwell will ship out a new one overnight or by courier so the company can be back in production the next day with minimal downtime. There are four options for companies interested in selling their surplus inventory: lot sell, consignment sell, account credit sell and quick sell, all of which hinge on the initial vetting by Radwell. Selling surplus starts with a form and communications between the company and customer regarding quotes. Selling surplus allows companies to free up space in their stock rooms. Storing surplus is a waste of time, energy and space for any company. Purchasing surplus, on the other hand, is a great opportunity for many companies. If a company has been running the same operations for 30-plus years, it is quite possible that it doesn’t want to spend millions to upgrade entire systems. Purchasing surplus from Radwell allows customers to replace older industrial electronic parts, rather than replacing the entire system. Surplus part sales provide an excellent opportunity for manufacturers looking to liquidate overhead, as well as for manufacturers looking for cost-effective, but high-quality, part replacements. See what surplus solutions Radwell has for your business.